You can slow down any recording without changing pitch using Voice Again. 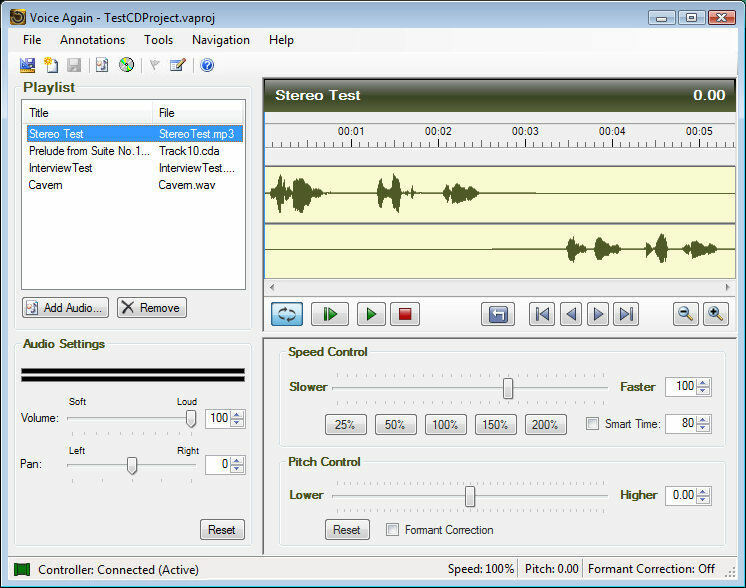 Optimized for voice, this software is designed for quick analysis and transcription of voice. Whether you are listening to an interview or transcribing a dictation, Voice Again is the right tool for the job. Slow down a recording up to 10 times! The high-quality signal processing in Voice Again maintains clarity at variety of speeds. Use the Voice Clarity feature to improve voice understanding. Zero-in, analyze and listen to any part of a recording with the advance playback tools. Superb noise reduction algorithms help to clean-up recordings by silencing noisy backgrounds, hiss and hums. Bookmark important parts of a recording with annotations. Textual flags give you lightning-quick navigation and a way of accurately documenting interviews or dictations. Compatibility with latest foot controllers such as the VEC Infinity In-USB-2 foot pedal. Just plug and play: instantly improve your productivity. Create new content by rendering high-quality audio files. The content can be used for review of a project, sharing and collaborating with others, or for adding to multimedia projects.